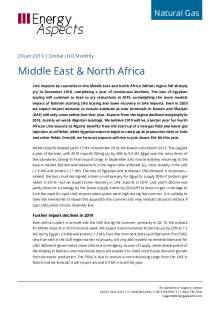 LNG imports by countries in the Middle East and North Africa (MENA) region fell sharply y/y in December 2018, completing a year of continuous declines. The loss of Egyptian buying will continue to lead to y/y reductions in 2019, outweighing the more modest impact of Bahrain starting LNG buying and some recovery in UAE imports. Even in 2020 we expect import demand to remain subdued as new terminals in Kuwait and Sharjah (UAE) will only come online late that year. Exports from the region declined marginally in 2018, mainly on weak Algerian loadings. We believe 2019 will be a better year for North African LNG exports as Algeria benefits from the start-up of a new gas field and lower gas injection at oil fields, while Egyptian exports begin to ramp up as production rises at Zohr and other fields. Overall, we forecast exports will rise to just above 104 Mt this year. MENA imports totalled just 0.17 Mt in December 2018, the lowest since March 2015. This capped a year of declines, with 2018 imports falling y/y by 42% to 9.5 Mt. Egypt was the main driver of this slowdown, taking its final import cargo in September and now tentatively returning to the export market. But demand elsewhere in the region also softened y/y, most notably in the UAE (-1.5 Mt) and Jordan (-1.1 Mt). 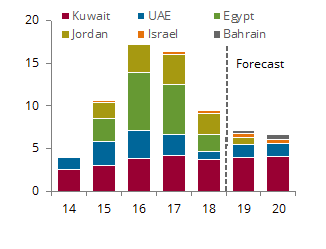 The loss of Egyptian and Jordanian LNG demand is structural—indeed, the two countries signed a deal in mid-January for Egypt to supply 50% of Jordan’s gas needs in 2019—but we expect some recovery in UAE imports in 2019. Last year’s decline was partly down to a strategy by the Dubai Supply Authority (DUSUP) to draw on gas in storage to limit the need for spot LNG imports when prices were high during the summer. It is unlikely to have the inventories to repeat this approach this summer and may instead choose to restock if spot LNG prices remain relatively low. Even with an uptick in arrivals into the UAE during the summer, primarily in Q2 19, the outlook for MENA imports in 2019 remains weak. We expect overall volumes to decline y/y by 25% to 7.2 Mt, led by Egypt (-2.0 Mt) and Jordan (-1.5 Mt). Even the imminent start-up of Bahrain’s first FSRU, which arrived in the Gulf region earlier in January, will only add modest incremental demand for LNG. Bahrain’s government views LNG as a contingency source of supply, while development of the Khaleej Al Bahrain unconventional basin will enable it to meet most future demand growth from domestic production. The FSRU is due to receive a commissioning cargo from the UAE in March and we forecast it will import around 0.4 Mt in total this year. The next regasification projects on the horizon are in Kuwait and the UAE. Kuwait’s 22 Mtpy terminal at Al-Zour will be commissioned in September 2020 according to a recent update from the Kuwait Integrated Petroleum Industries Company (KIPIC), which is overseeing the project. The facility will replace the 5.5 Mtpy FSRU at Mina Al-Ahmadi. We expect LNG imports to rise once the terminal comes online, in part due to the energy intensive refining and petrochemical facilities that are also part of the Al-Zour project. The development of domestic supplies from the Jurassic field will likely cap the increases, although the next 0.5 bcf/d phase is only due online in 2023 and is mired in political uncertainty. The Emirate of Sharjah expects to bring its 3.8 Mtpy FSRU—the third in the UAE—online by late 2020, around the same time as a new storage facility. In both countries, LNG demand is only likely to benefit from 2021. MENA exports of LNG were marginally higher y/y at 9.21 Mt in December 2018. Over the year as a whole, exports fell by a slight 2% y/y to just below 103 Mt. Omani exports grew by 1.4 Mt y/y thanks to output from the Khazzan gas field. Egyptian exports also began to tick higher late in the year, with Q4 18 loadings above 0.6 Mt for the first time since Q3 13, a trend we forecast will continue through 2019 (+1.2 Mt to 2.5 Mt). These gains were only partially able to offset the weakness in Algerian loadings, which fell by 3.4 Mt to 9.0 Mt. 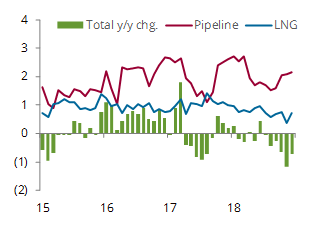 Algerian LNG loadings initially fell because of higher pipeline exports to Spain and Italy but remained low in Q4 18 even as pipeline volumes have under performed. This reflects increased gas injection to boost oil output after OPEC production cuts were eased, as well as natural declines at older fields. Algerian exports should rise in 2019 as OPEC has agreed new oil production quotas starting from January, reducing the need for gas injection, and with the 4.5 bcm/y Touat gas field currently scheduled to start up in February. Finally, Qatar, the region’s largest LNG exporter, will likely keep volumes steady around 78 Mt once again in 2019 as it pushes ahead with plans to take an FID this year on the four train, 33 Mtpa supply capacity expansion project, which it aims to bring online by 2024. Overall, we expect MENA exports to increase marginally to just over 104 Mt in 2019.